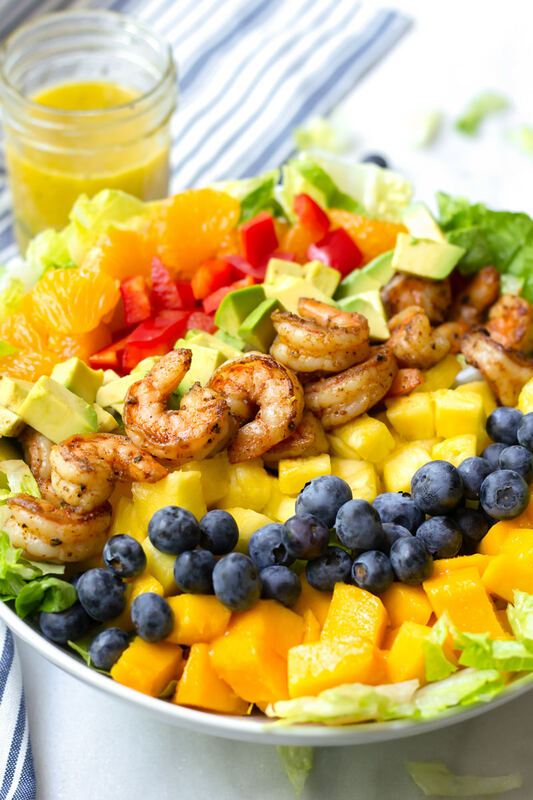 This refreshing summer Tropical Shrimp Salad is loaded with sweet mangoes, pineapple, blueberries, mandarin oranges, avocado, and red bell peppers. 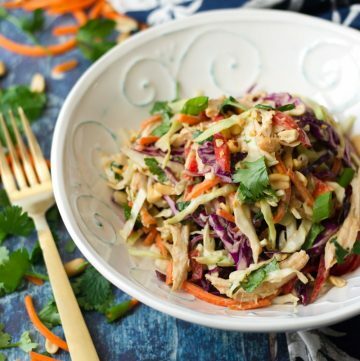 Drizzle it with homemade Orange Poppy Seed Dressing! Anybody here gets excited about all the delicious and ripe fruits available during summer? I certainly do! Sweet mangoes, fragrant pineapples, plump and juicy blackberries, bright red strawberries, all the other berries (yess! 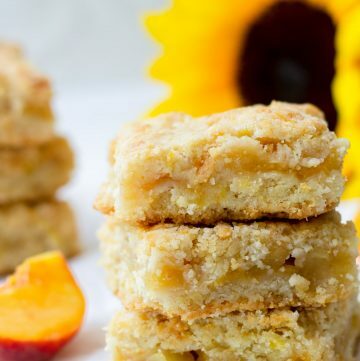 ), ripe peaches…okay, I feel like I am dreaming right now. 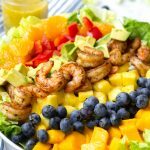 I put the most delicious summer fruits in this salad bowl with some flavor-packed seared shrimp. 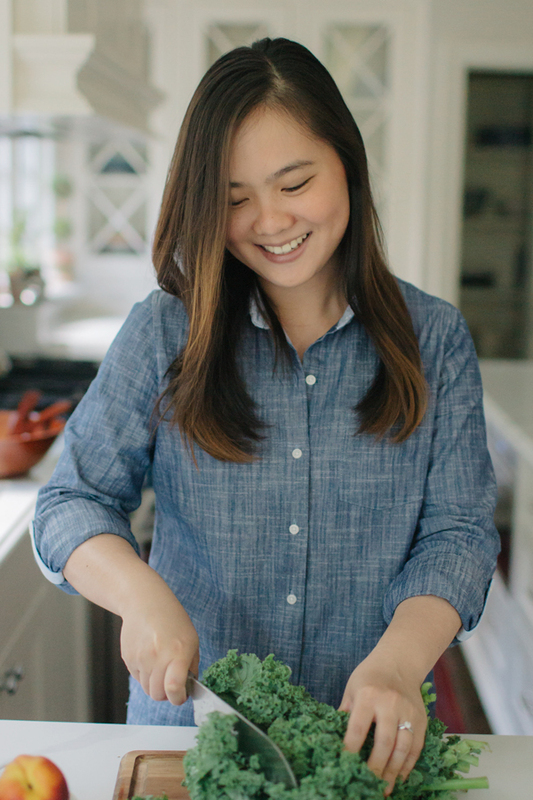 And…well, avocado had to make it into this bowl too because who doesn’t love avocado?! 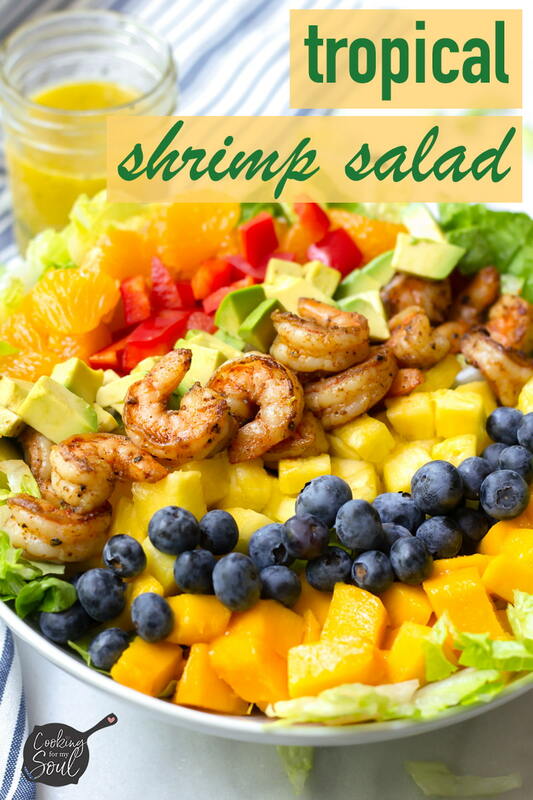 This salad also has diced red bell peppers and finely diced red onions to balance out the sweetness of the fruit. It’s so good! The shrimp needs to marinate for about 20 minutes in olive oil, garlic powder, onion powder, chili powder, cumin, salt, and ground black pepper. 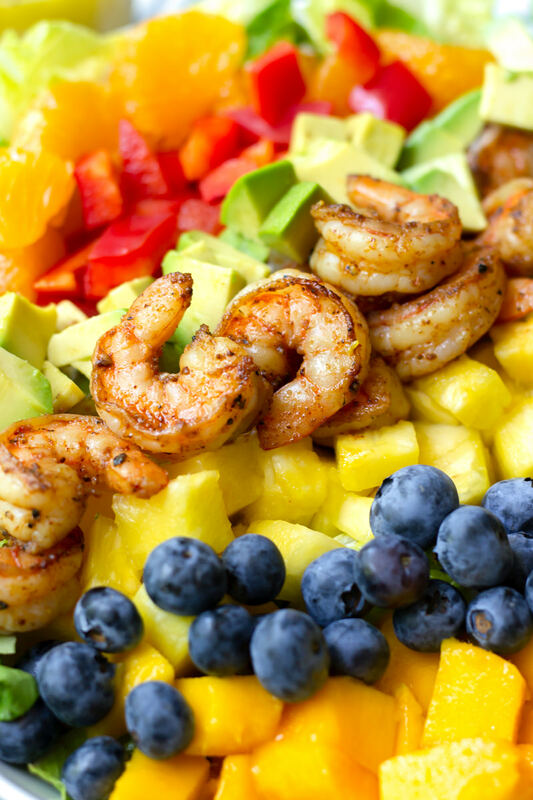 After that, quickly sear the shrimp and you’ll get the most flavorful shrimp ever! 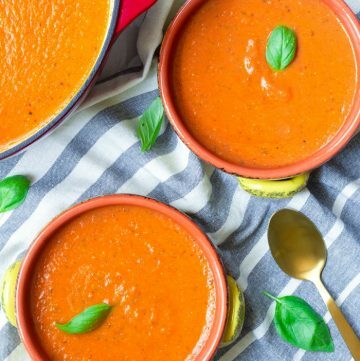 Oh and the dressing, oh my the dressing…! It’s light and fresh, with the perfect amount of sweetness. Simply combine dijon mustard, olive oil, freshly squeezed orange juice, minced garlic, poppy seeds, salt and pepper and you’ll be in summer heaven! 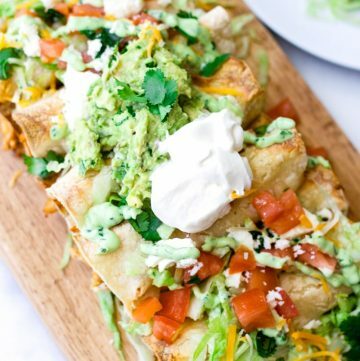 Make it this weekend for a perfect meal to share with friends and family. Or just for yourself. It will be just as delicious either way! Look for mangoes that smell sweet and feel just a little bit soft to the touch. If they feel too hard, they are probably not ripe yet. Color will change depending on the variety, but generally, look for ones that look mostly yellow and orange. A ripe pineapple should smell sweet and have a yellow and golden color. Avoid pineapples with wilted leaves, feel mushy to the touch, smell vinegar-y, or look dull. 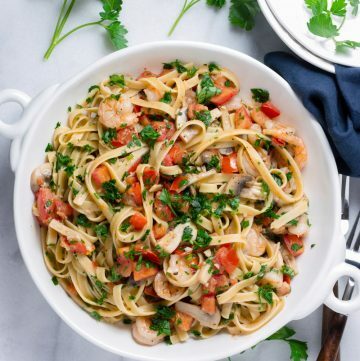 Don’t overcook the shrimp! 2 minutes per side should be sufficient. 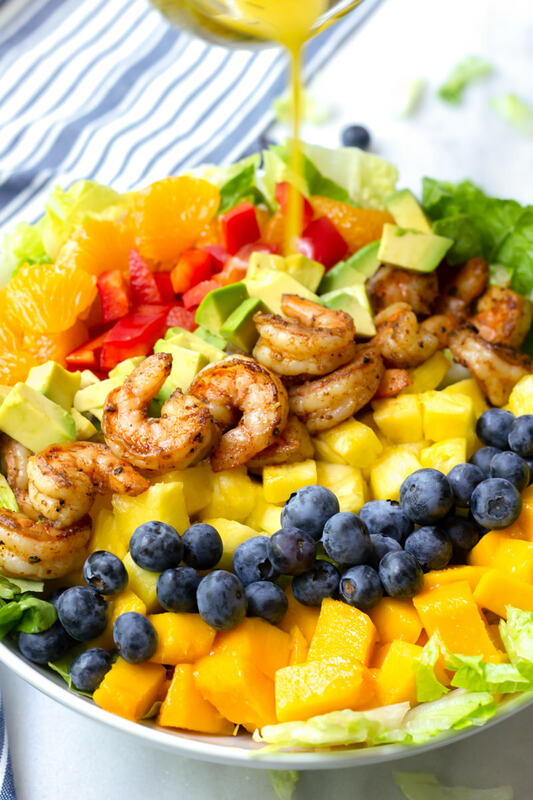 Flavor-packed seared shrimp, sweet fruits, and healthy veggies make this salad so so so good! 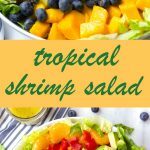 Shrimp: Toss and combine shrimp and shrimp marinade ingredients in a large bowl. Cover bowl with plastic wrap and let sit in refrigerator for 20 minutes. Then, heat a large non-stick pan with olive oil, and cook shrimp about 2 minutes per side, until cooked through. Set aside. 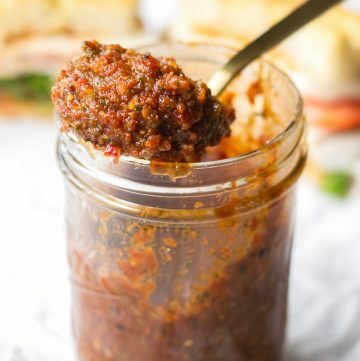 Orange Poppy Seed Dressing: Combine all dressing ingredients in a mason jar, and shake vigorously until well-combined. 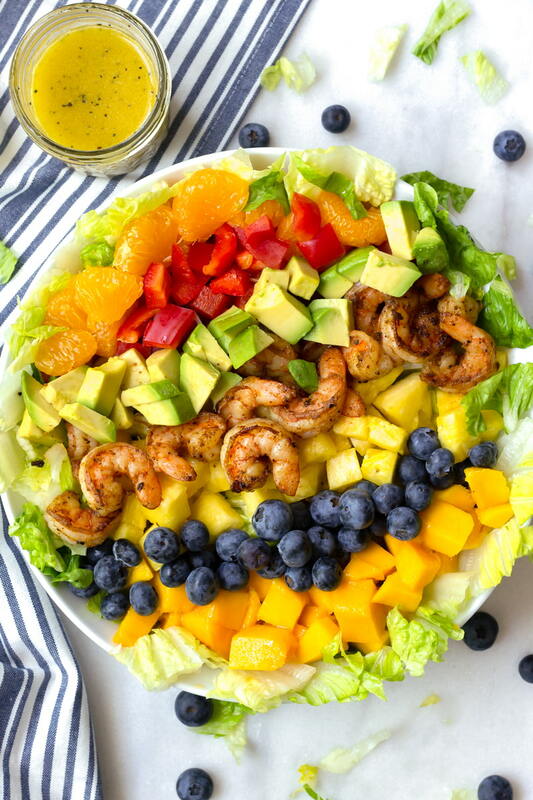 Assemble the salad: In a large salad bowl, toss together the lettuce, red bell peppers, red onion, mangoes, pineapple, mandarin oranges, avocado, and shrimp. Drizzle with some Orange Poppy Seed Dressing, to taste. Serve immediately. Enjoy!